Upgrade to 'The Works' Economy Class for an extra $55pp return ex Auckland. Travel from Wellington or Christchurch add $169 pp return via Auckland. 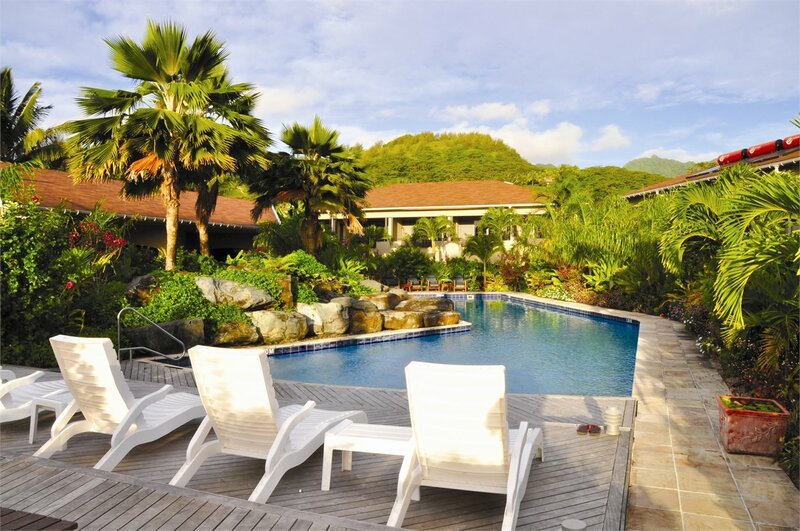 Opposite a stunning white sandy beach this friendly and relaxed boutique property is set in tropical gardens and located on the south western sunset side of the island. The spacious units are all fully self contained and are ideal for singles, couples and families. Includes: Complimentary use of snorkeling gear, sun loungers, beach towels. 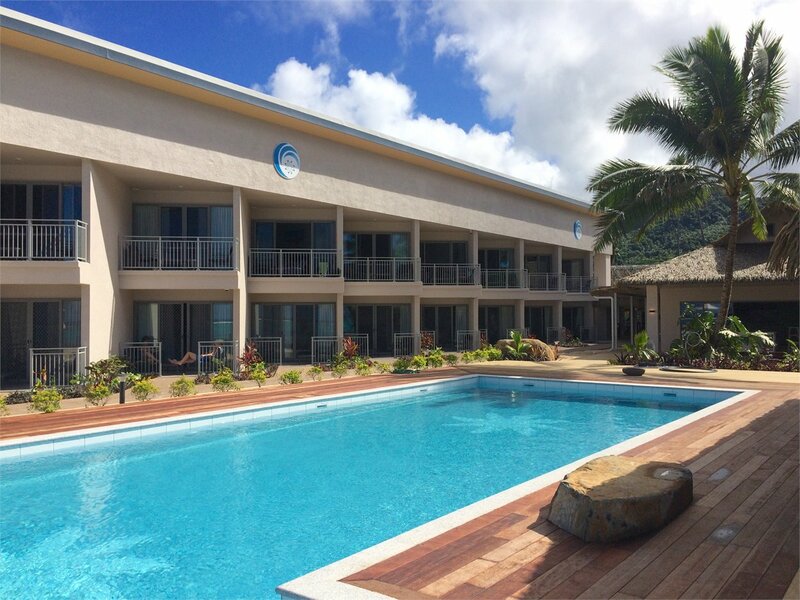 Located on the northern coast of Rarotonga alongside a picturesque coral beach and sparkling blue lagoon, Club Raro offers excellent value for money. With thatched roofs, lagoonside sundecks, palm frond shade huts and a centralised pool area complete with swim up pool bar, a great place to relax. Includes buffet breakfast, complimentary use of snorkelling gear, reef shoes, beach towels, board games, 1 x intro dive per person in the pool, luggage storage on arrival or departure. Honeymooners receive a complimentary bottle of sparkling wine and a FREE room upgrade (subject to availability on check in). Set in the enchanting area of Vaimaanga on the stunning southern coast, Palm Grove offers you your own private piece of paradise. 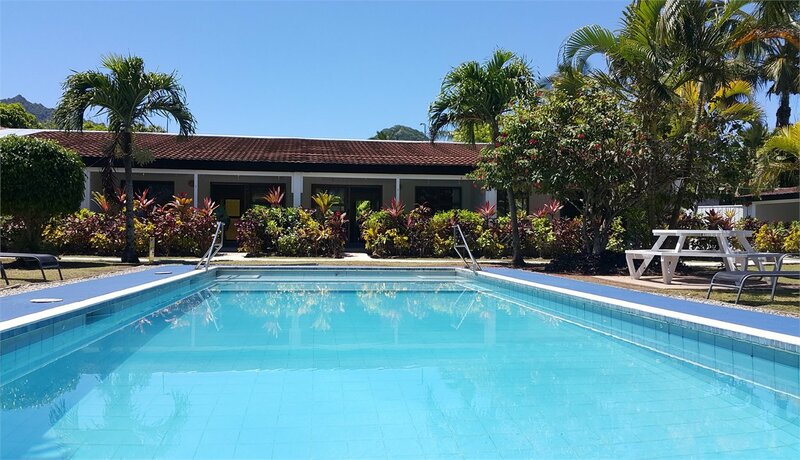 26 individual Studio to Three Bungalows are scattered over 5 acres of landscaped beachfront and garden property, and are ideal for couples, families or groups. Includes tropical breakfast daily, complimentary use of snorkel equipment, kayaks, beach chairs and beach towels. NOTE: Child age for this property is 0-5 year, a charge applies for children aged 6 years and above. 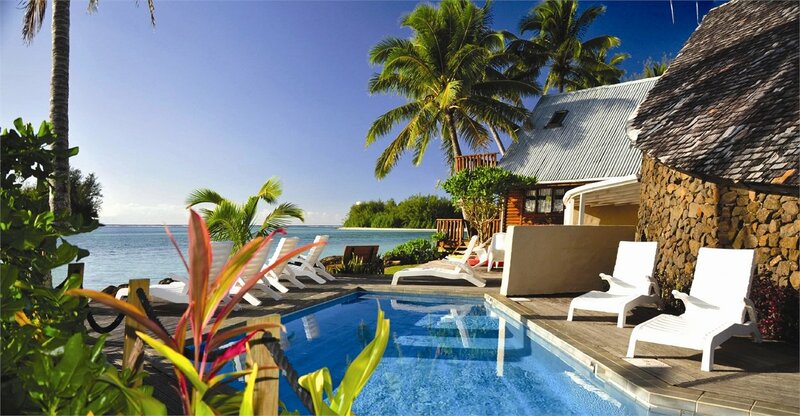 The best-known Cook Islands full-service resort, offering affordable luxury on the sheltered west coast of Rarotonga. 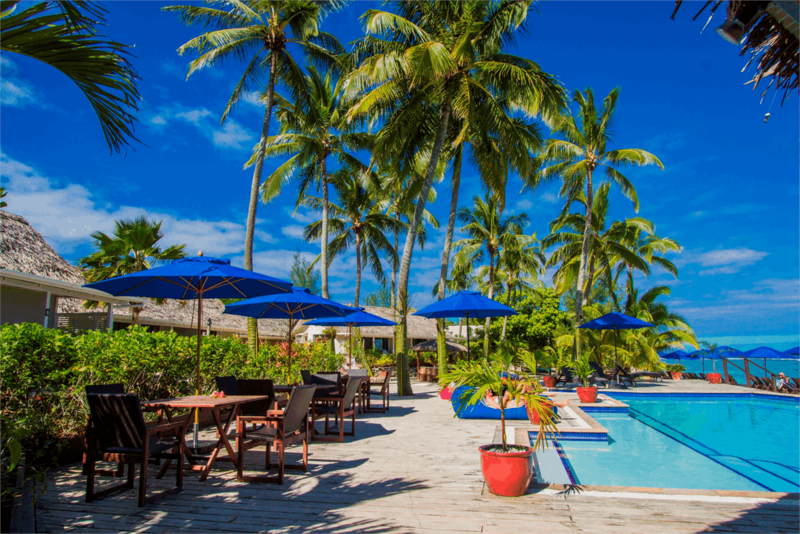 Located on a white sand beach, offering a wide range of accommodation and dining options, with activities for all ages, this resort caters to all tastes and budgets. Includes tropical breakfast daily, free use of snorkelling equipment, tennis courts and equipment, a daily on-site cultural activities programme and Free use of Coconut Kids Club for children 4-12 years and under (conditions apply). 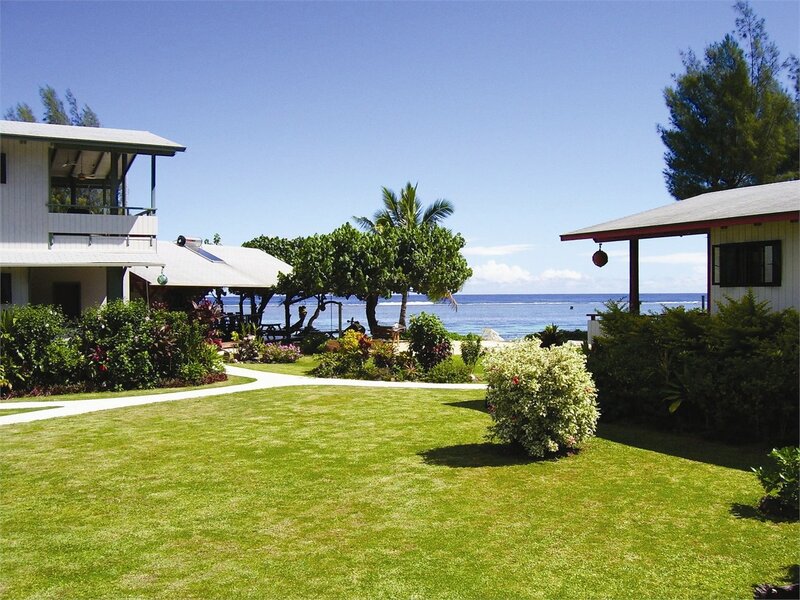 Located opposite its own stunning white sandy beach on Aroa Lagoon & Marine Reserve, Rarotonga. 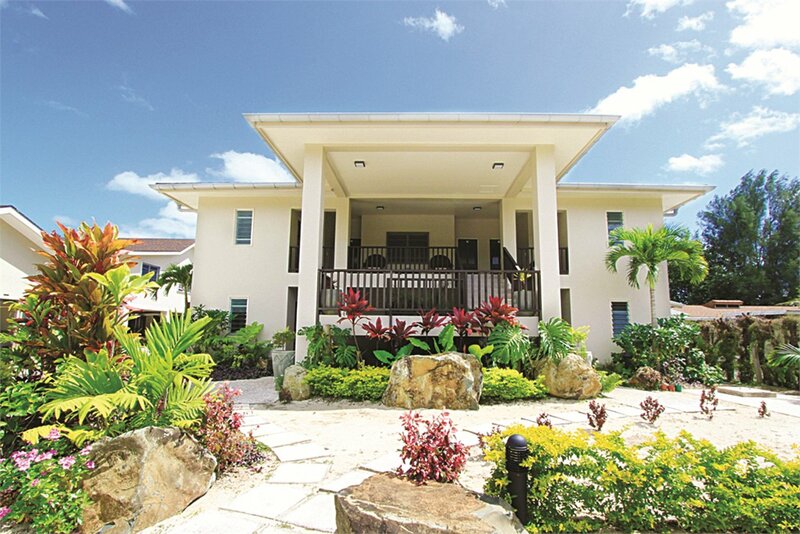 This expansive 4 acre lush garden property offers 18 spacious, stand-alone Villas with a full range of rooming options, and provide a home away from home experience. Includes tropical breakfast daily, free use of snorkelling gear, kayaks, sun loungers and beach towels. Honeymoon couples receive a bottle of bubbles on arrival. 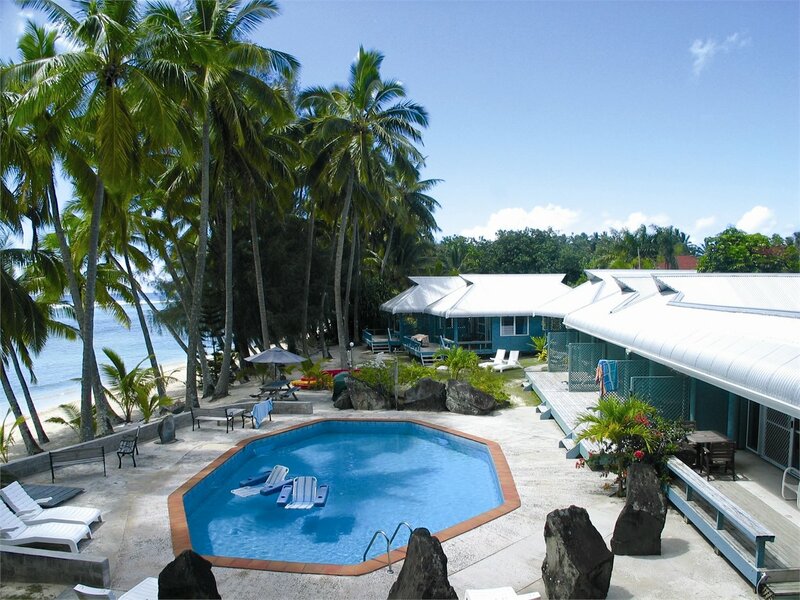 Located on a white sand swimming beach on the west sunset shore of Rarotonga is the intimate Aro'a Beachside Inn. With 12 tastefully appointed units your privacy is guaranteed. Enjoy swimming and kayaking at all tides, work on your tan or partake in a cocktail at the "The Shipwreck Hut ". Includes 1 FREE night for the Beachside Deluxe room ONLY. Reconnect with life in our romantic island hideaway… plus child free tranquillity! On the sunset side of Rarotonga, this private secluded boutique property is nestled amongst mature tropical palms at the waters edge. Superb modern self contained fully serviced Bungalows, Suites and Studios. 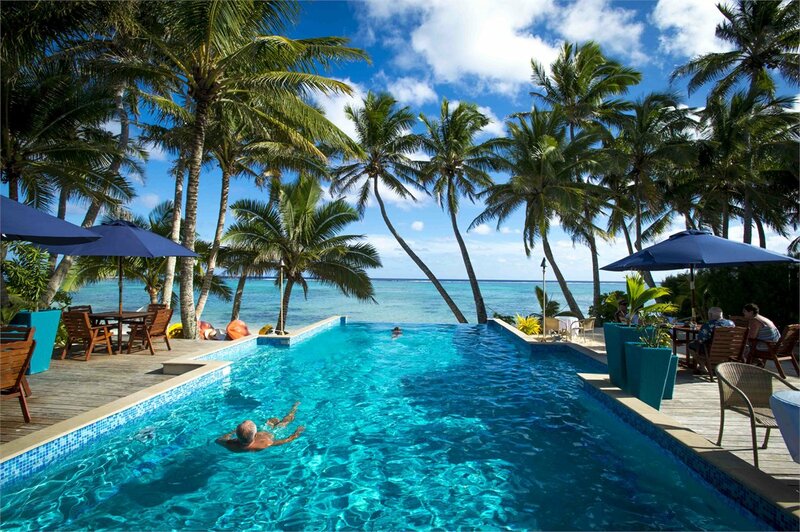 Located on Rarotonga's stunning southern coast on a beautiful 10km stretch of white sand beach, this boutique hotel overlooks the pristine waters of a crystal clear lagoon teeming with colourful fish, the perfect spot to swim or snorkel. Choose from either Beachfront Studio or Deluxe Studios. Includes a complimentary daily tropical breakfast at Sands Resturant (consists of cereals, bread, butter, assorted spreads, fresh fruit, milk, juice, tea and coffee) and complimentary use of snorkelling gear and kayak equipment. 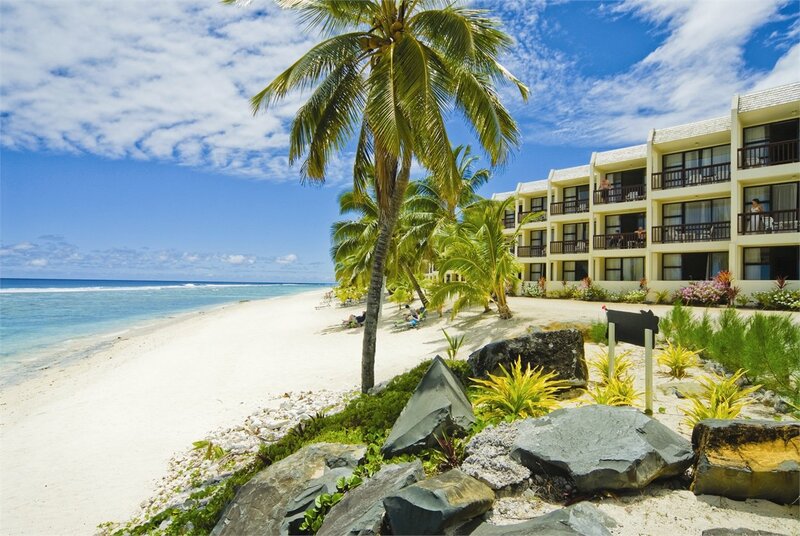 Idyllically set on a secluded beachfront location on the sheltered western side of Rarotonga, the Sunset Resort is conveniently located just an 8 minute drive from downtown Avarua. With 35 beautifully appointed air-conditioned suites either beachfront or beside the pool amid lush tropical gardens. Includes tropical breakfast daily and complimentary use of snorkelling equipment and DVD&#39;s.
NOTE: Children 12 years and over are welcome at this property. Located in the picturesque village of Vaimaanga, a short 5 minute drive away from the hotel. Nestled in a 2 storey building directly overlooking a beautiful white sandy beach and sparkling lagoon, each spacious Villa provides easy beach access and features 2 bedrooms/bathrooms and a modern kitchen. Includes tropical breakfast starter pack on arrival (consists of cereals, bread, butter, spreads, fresh fruit, milk and juice) and complimentary use of snorkelling gear &amp; kayak equipment. Honeymoon couples receive a bottle of wine on arrival. Ensuring a truly relaxing holiday, Muri Beachcomber is an intimate property perfectly located on the white sandy shores of beautiful Muri Lagoon, right in the heart of Muri Village. Stylish rooms offer separate air-conditioned bedrooms, spacious living/dining area, well-equipped kitchen and modern bathroom. Includes a breakfast pack (consists of cereal, milk, juice, toast bread and spreads) daily, complimentary use of barbeque&#39;s, reef shoes, kayaks, stand-up paddle boards and snorkelling equipment and free local calls. NOTE: Children 0-11 years are welcome in the Garden and Family Garden Units only. 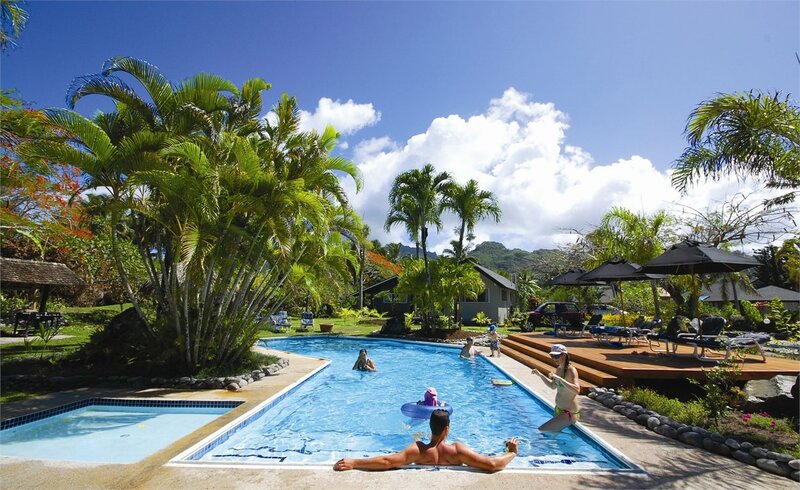 Located on the sheltered East Coast of Rarotonga fringed by palm trees, white sand and the stunning Muri lagoon is Moana Sands Lagoon Resort. The intimate adult only, two storey resort complex features private lagoon view studios, a swimming pool, onsite restaurant and bar. 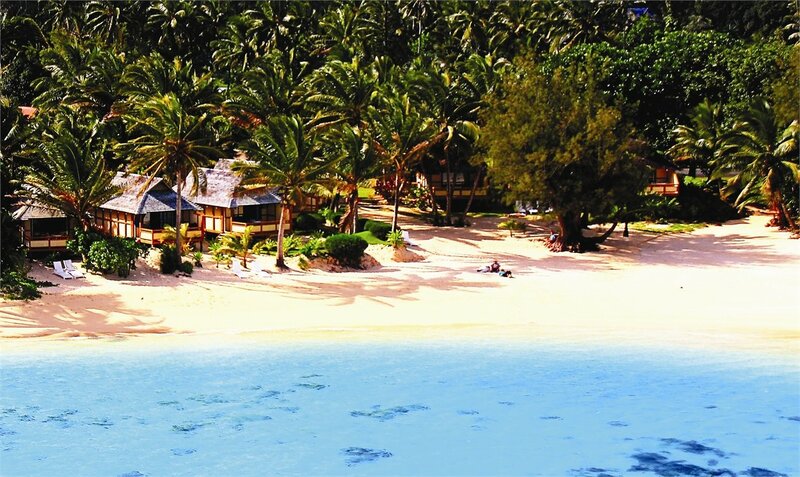 It is the ideal destination for those seeking a romantic Cook Islands escape. Includes: Continental breakfast daily, complimentary use of snorkeling gear and kayak equipment. Honeymoon couples receive a bottle of wine on arrival. Marvel at the magical sunsets over a sparkling blue lagoon, while lounging on your sheltered, white sandy beach fringed with swaying coconut palms. Wander through the gardens on your way to the beach side infinity pool. Rest your elbows on the pool edge and soak in the view across the beach. Includes tropical breakfast daily, free weekly cultural activities, 24 hour offsite gym access, free use of snorkelling gear and kayaks. 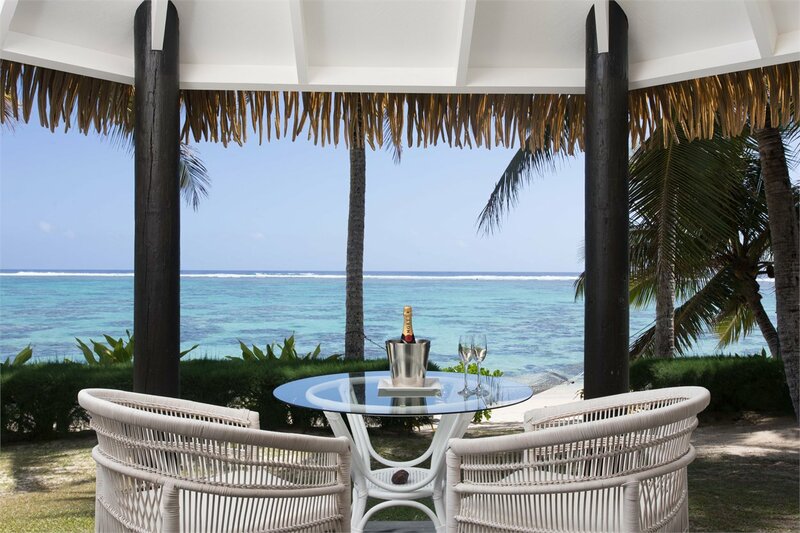 Honeymoon couples receive a complimentary bottle of bubbles and island style gift on arrival. NOTE: Children 16 years and over are welcome at this property. This 'World's Leading Island Villa' (World Travel Awards) villa property gives you the freedom to personalise your own leisure experience. Set on the beautiful white sand beach of Rarotonga's stunning Muri Lagoon, your private villa awaits you... How you choose to use it is completely up to you..
Includes complimentary Snorkelling Cruise for two on the Pacific Resort Rarotonga&#39;s &#39;Moana Roa&#39; glass bottom lagoon cruiser &amp; complimentary bottle of wine on arrival. 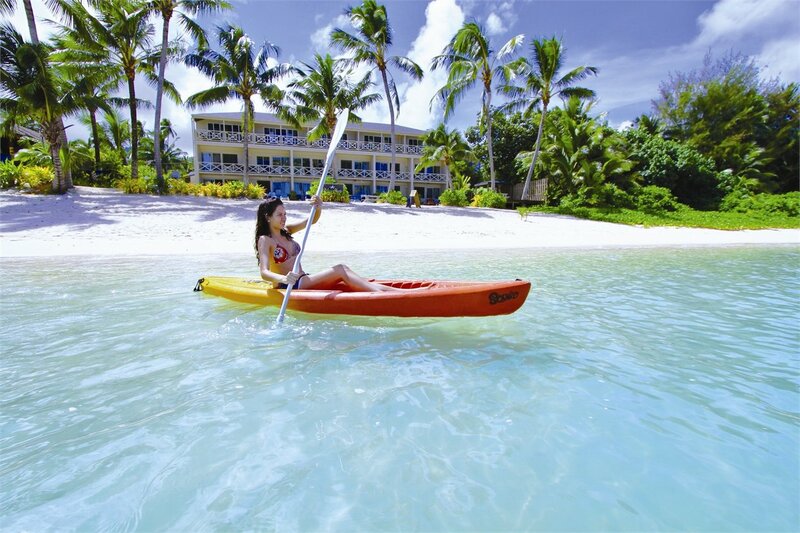 Free use of kayaks, snorkelling gear, sun loungers and beach towels PLUS use of facilities at Pacific Resort Rarotonga which includes free scheduled daily activities at the Beach Hut, free garden tour and free introductory scuba diving sessions in the pool. 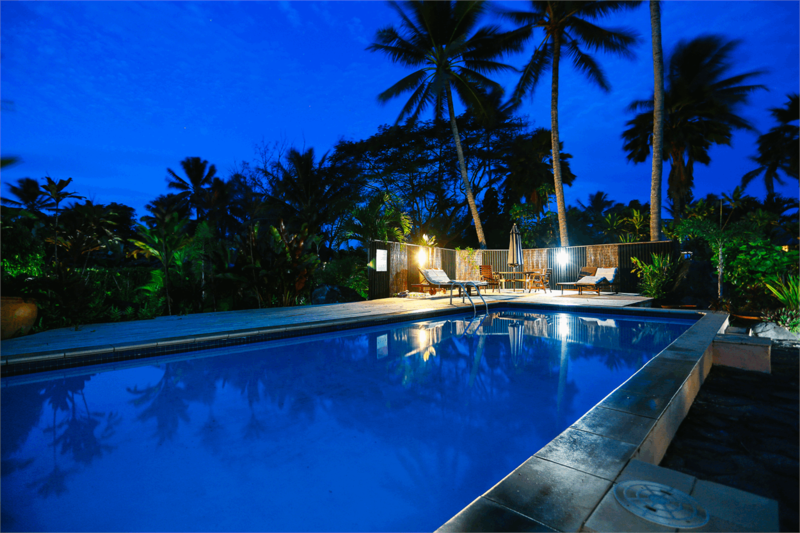 Situated on the eastern side of Rarotonga on magnificent Muri lagoon, Manea on Muri feature 8 Villas ranging from Three Bedroom Villas perfect for families or friends, to intimate One Bedroom Villas ideally suited for couples. Each Villa boasts a large sundeck for outdoor living. Includes: Welcome breakfast starter pack, complimentary use of snorkelling equipment and kayaks, laundry facilities. NOTE: Three Bedroom Garden &amp; Beachfront Villa bedding is 2x King Splits &amp; 2 x Single beds. Intimate Villas of distinction. A small and intimate resort situated right on stunning Titikaveka lagoon. The beach here is of dazzling white sand and edged with waving palm trees and stretches for some 8km. Perfect for couples and honeymooners who are looking for a small intimate hideaway. Includes a welcome tropical breakfast basket &amp; a welcome drink on arrival, a personalised guest orientation and complimentary use of snorkelling equipment &amp; kayaks. Stay 2 additional nights for the price of 1. Honeymoon couples receive a fruit basket and bottle of sparkling wine (minimum 4 night stay applies). NOTE: Children 18 years and over are welcome at this property. Crown Beach Resort & Spa presents a private secluded space for just 36 couples to escape in 5 acres of tropical gardens and an endless icing sugar beach that caresses a sparkling blue lagoon. This place is sure to unleash your desire with the one you love. Includes daily Tropical breakfast with one hot selection daily, a welcome drink on arrival, nightly turndown service, discounted drinks during happy hour and use of snorkeling equipment and kayaks PLUS stay 2 extra nights for the price of 1. Honeymoon couples receive a complimentary bottle of sparkling wine and a fruit platter on arrival (minimum 5 night stay applies). 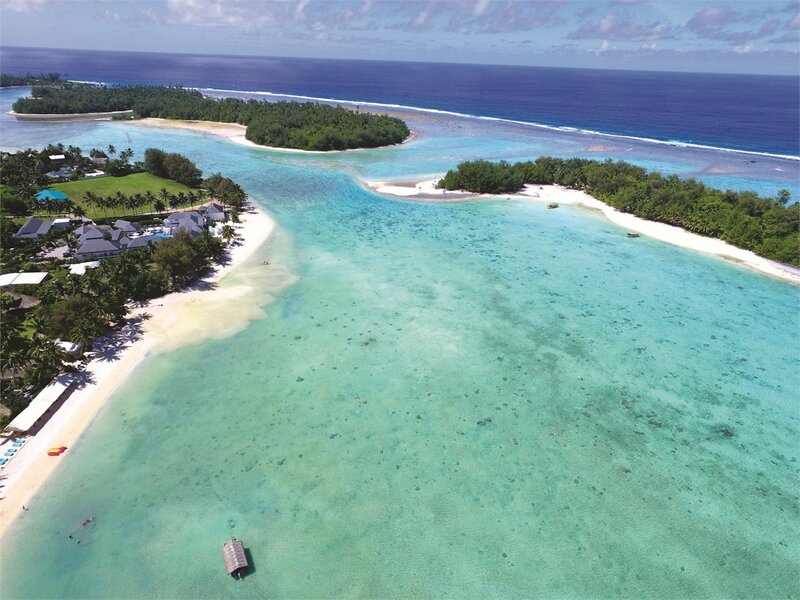 Rarotonga's leading full service authentic boutique resort is nestled discreetly in one of the world's most spellbinding spots. 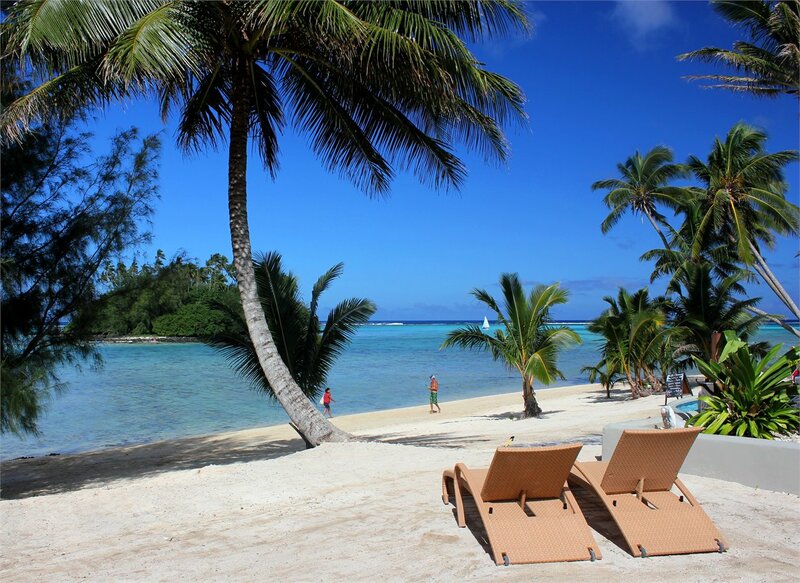 Stretching one kilometre along the south-eastern coast of Rarotonga, Muri beach is laden with glorious white sand, fringed by palm trees and lapped by the gentle waters. Receive a NZ$250 Food and Beverage credit per room per stay. For each additional night you stay receive an additional NZ$50 Food &amp; Beverage credit per room per stay. Includes: Tropical Breakfast daily, FREE scheduled daily activities at the Beach Hut, FREE kids activities for children aged 6-12 years, FREE use of kayaks, snorkelling gear, beach towels and sun loungers. Includes tropical breakfast with one hot selection daily, complimentary use of snorkelling gear, kayaks, stand-up paddle boards, beach towels, invite to a weekly Managers cocktail hour and complimentary use of internet at reception. NOTE: Adults 18 years and over are welcome at this property. 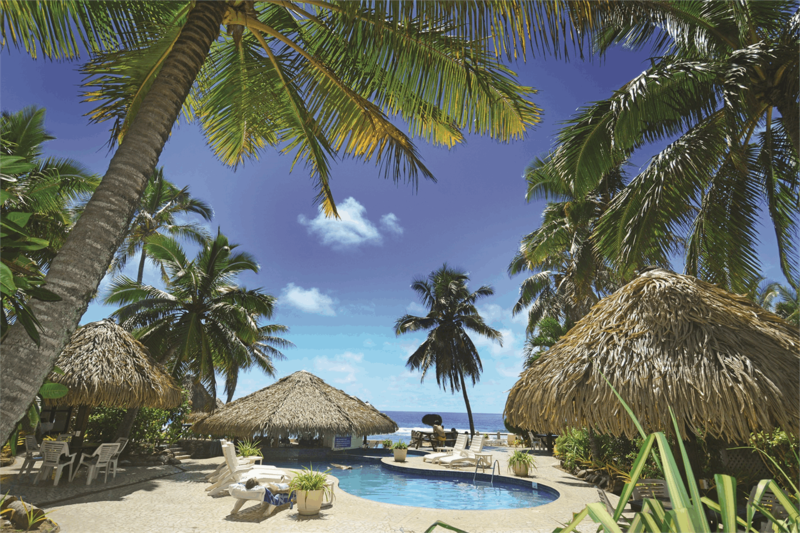 Nestled on the southern tip of Rarotonga, Little Polynesian Resort is a sophisticated playground for grown-ups. Here, serenity is certain, seclusion is guaranteed, and romance is everywhere. This is a Resort of unpretentious luxury where idyllic beaches beckon. Includes tropical breakfast daily, welcome drink and scented cold towels, complimentary snorkelling equipment, use of kayaks and stand up paddle boards. Upgrade to a Beachfront Bungalow and receive NZ$50 resort food &amp; beverage credit per room per night (minimum 5 night stay applies) Honeymoon couples receive a bottle of wine, with a small gift and flowers in room. Nautilus Resort brings together a range of world class amenities including a beachfront restaurant, chic beach bar and an immense infinity swimming pool along with premium luxury accommodation all with salt water plunge pools, all positioned alongside a stunning turquoise lagoon. Includes full breakfast daily. Fruit platter on arrival, own private outdoor salt water plunge pool, a WiFi internet connection starter pack, complimentary use of watersports equipment and resort activities, concierge service to explore the island of Rarotonga, kids concierge for children aged 5 and over. Holiday going well.... until you crash into a car! Holiday planning going great.... until you fall off your scooter! 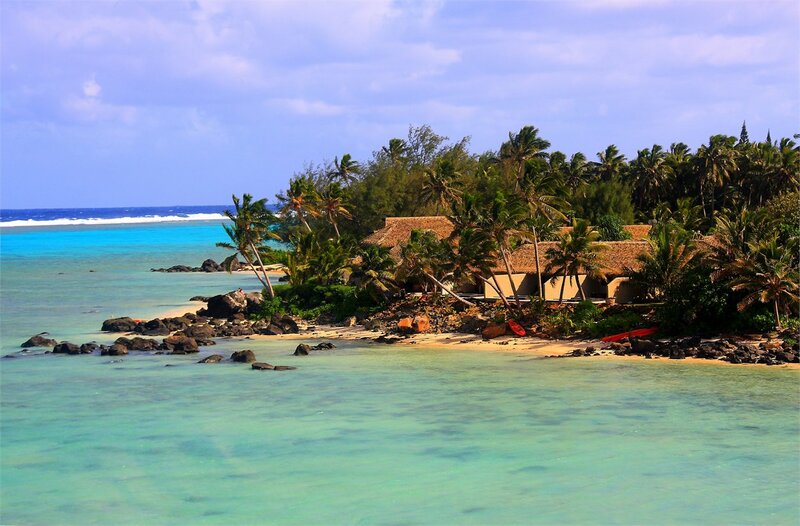 Rarotonga – a step back in time. 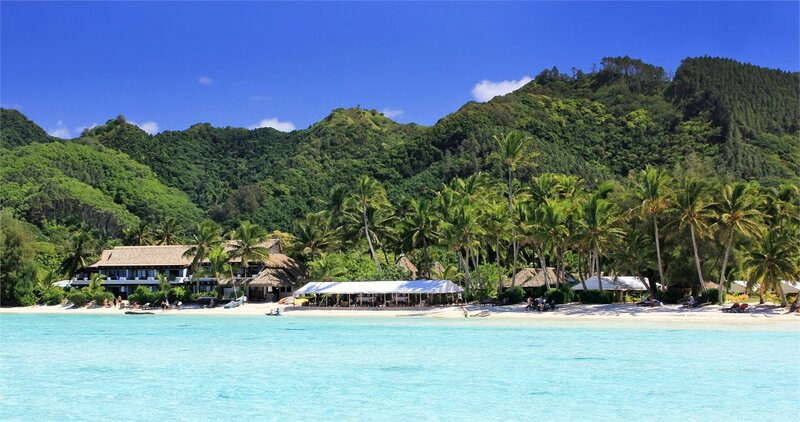 Rarotonga - the PERFECT winter escape! Cook Islands - Something for everyone! PACKAGE TERMS & CONDITIONS: It is our policy to present the cost of our holidays inclusive of all airport and government charges. Please accept however that these charges are not within our control, therefore we reserve the right to pass on any increase.. Travel agent professional service fees where charged, will be additional to the advertised prices. Closeout and blackout periods apply over school holidays and peak holiday periods & availability of seats & rooms is likely to be very limited over this time . Payment & ticketing deadline - no more than 7 days after reservation confirmation (excluding NZ7000 series operated by Virgin Australia and DJ8000 series which must be ticketed within 24 hours of PNR creation). Payment & ticketing deadline - no more than 7 days after reservation confirmation. If booking is made within 14 days of departure ticketing must be completed within 48 hours of reservations. Payment & ticketing deadline - no more than 7 days after reservation confirmation. *Child prices are based on one or two children of 2-11 years sharing a twin room with 2 adults (varies by property and room type). Family pricing is based on a per person cost for 2 adults and 2 children (2-11) sharing one room and using existing bedding. Extra night rates are per person.. Valid for sales to 31 Mar 2020. Valid for travel commenced and completed within the period 22 Apr 2019 to 31 Mar 2020 (unless otherwise specified). Min 5 nights/Travel must be completed by 31 Mar 20.Prices are ex Auckland. For departures ex Wellington please add $169 per adult and add $169 per child. For departures ex Christchurch please add $169 per adult and add $169 per child. Book Air New Zealand K Class 'Seat + Bag' airfare ex Auckland. Book Air New Zealand L Class 'The Works' airfare ex Auckland. Book Air New Zealand V Class domestic within New Zealand. Routing: CHC/WLG (NZ)-AKL-RAR (NZ) and v.v Upgrade to 'The Works' from $55 per person return ex Auckland. Quad pricing is based on 4 adults sharing the villa/apartment. Sightseeing Tours are subject to availability and may not operate on public holidays, Xmas Day or New Year day. New Zealand School Holidays travel dates have been closed out on this flyer, travel over these periods is subject to availability, ask a consultant for a quote. Pricing correct as at 27 Sep 18. AFC: K Class 'Seat + Bag' Opt In-E1 / Opt Out-GC. L Class 'The Works' Opt In-E3 / Opt Out-FF. Important: An additional airfare surcharge of $11 per person each way applies to travel in either direction on Friday, Saturday or Sunday Prices shown are based on per person costs in New Zealand Dollars, for payment by cash, cheque or eftpos only. Credit card sales not permitted unless Travel Agent acts as a merchant. Capacity limitations apply and may not be available on all services. Travel requiring an overnight stay in New Zealand will be at passengers own expense. Events beyond our control such as currency fluctuations and changes to the price of aviation fuel may result in prices variations . Strict cancellation fees apply. Packages are based on consecutive nights. For split stays please contact your travel consultant. These airfares are not eligible to accrue Airpoint Dollars. They are not upgradeable using airpoints and no Airpoints Companion tickets may be purchased in conjunction with these fares. For full terms and conditions and cancellation fees please contact your local travel agent for more information. Trade enquiries via GO Holidays. ISSUE DATE: 27 SEP 18.